Clean and simple style and pure functionality in the kitchen. This oil or vinegar bottle is 16oz / 500ml, 11" tall and made of porcelain. 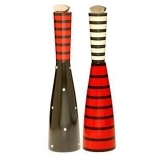 Salt & Pepper Shaker Set, stackable, 1.5" / 3.5cm H, brushed stainless steel. Gift boxed.